Jacques Tati's 1967 masterpiece, Playtime, is one of those special films that entertains as it enlightens. On its surface, it is a comedy constructed in the fashion of classic silent films by the likes of Chaplin, Lloyd, and Keaton, where hapless characters bumble through increasingly complex scenarios that befuddle them while amusing the audience. Like his talented forebears, however, Tati uses his comedies to uncover larger truths about human nature and society. In Tati's case, he is particularly interested in how the common individual deals with an increasingly perplexing technological world. His recurring character, whom he portrays himself, is the pipe-smoking Monsieur Hulot, the every-man stand-in. Hulot is genial, but hapless, always stepping into the wrong mess while wearing the wrong pair of shoes, but somehow coming out of the other side with his laces tied and a fresh new shine. The Criterion Collection originally released Playtime in 2001, but it went out of print a little over a year later. Since then, fans have been waiting patiently for the much anticipated re-issue. The rumor mill promised a restored version of the film, spruced up to match new standards of technology--a process I am sure would cause Monsieur Hulot to scratch his head in confusion. Thankfully, the folks at Criterion suffer from no such confusion, and they've put together an all-new two-disc package that is cause for great rejoicing among film fans. Playtime is an intimidating film to write about. Completely free of a conventional plot, Playtime chronicles twenty-four hours in Paris. From the airport to the city center and back again, we follow a gaggle of American tourists (all women) on their vacation. They, of course, cross paths with Hulot, and their misadventures expose the ludicrously complicated excess of modern innovation. Filmed with very little dialogue, the story of Playtime was more like an unreal vision of what could have been the Paris of tomorrow than it was a contemporary take on the city; yet, by showing where people were heading, Tati was able to say some things about where they already were. Given technology's still increasing hold on our lives, his wry observations are possibly more apropos in 2006 than 1967. In Tati's world, machines are confounding; yet, they are ever-present. Aged gentlemen stand before huge banks of buttons, punching in an increasingly complex code to achieve rather small results. Tati has seen how this technology has opened up the world by granting more possibilities to all, and to reflect that, he has constructed office buildings with walls made entirely of glass and corridors that appear to go on forever. He knows it's a double-edged sword, however: while the glass opens things up, it also pushes us farther apart. 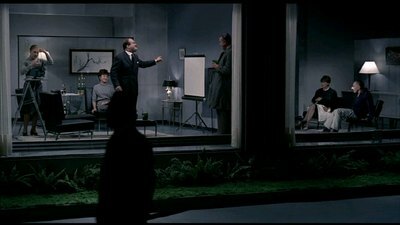 Hulot stands in a glass room, completely visible from the outside, but impossible to hear. So, he may be seen, but he can't communicate, and opportunities pass by in full view. More potent is the later image of an apartment building where the outer walls are all really windows. People go on with their lives, acting out their private dramas in plain sight--except they take no notice of people on the street, and the people on the street take no notice of them. In the same sequence, Tati has fun skewering entertainment, as well. The side-by-side apartments all have their television sets located in the same spots on their adjoining walls. At one point, we see two families both watching their sets as if they were staring at each other, and at another, drama plays out on one side of the wall while the neighbors appear to be sitting and watching. As the scene fades, a man undresses as if doing a striptease for the woman next door. We have become each other's entertainment! Surely Tati wasn't looking into the future and predicting reality TV? Of course, as I've said, living in Tati's world isn't all bad. Modernity is not entirely subsumed by alienation. In its way, it has made the world a much smaller place, as represented by the variety of international visitors coming to Paris. The film, even with its absence of constant dialogue, is more multilingual than it is French. Many scenes are in English, and I heard other languages come through as well. All the tourists who have come to France are connected, acting in tandem. They may separate at one corner, but they are reunited at another. The growth of one common experience can be seen in the symbolism of one of the more playful visual gags running through Playtime. Tati has unleashed an army of Hulots on Paris. Other characters run up to men of every race, age, and size who are wearing Hulot's regular raincoat and hat, mistaking these impostors for Hulot even as the real Hulot passes by undetected in the background. Not even our bumblers are that unique anymore. When night sets, all the various tourist groups and the locals come together for one big party. It's here that Tati creates his best microcosm of modern living. The party is at a restaurant on its first night. The final touches of the construction are still being hammered out when the first diners step through the door. As the revelry carries on towards dawn, the new restaurant falls apart, turning into one giant mess. Yet, the party rages on. Regardless of how much our creations fail us, humans don't buckle under, we endure. Love can even be found here, as seen in the ungainly courtship of the young American (Barbara Dennek) by Hulot. And so it will always be. Surely this is what Tati intends us to take away from the final shots, wherein the American ladies load back into their bus to catch their flight home? Locking them in Parisian traffic, Tati then pulls his camera back to show that everyone is traveling in a circle. Life continues to go around, same as it ever was. Heck, the visitors didn't even go very far into the city, their various activities really happening on the same city blocks. Famous sites like the Eiffel Tower are only spotted as reflections in windows somewhere behind the traveler. It could be seen as cynical, no one really has their own experiences anymore, they just view the experience, but I think Tati had something more uplifting in mind. If he didn't, could Playtime be so absent of despair? The final image that sticks with the audience as Playtime nears its end is when the courted American woman finds a small brooch shaped like a flower at the bottom of the gift box Hulot gave her. As her bus carries on towards the airport, we see that the streetlights that have grown up around it echo the shape of her flowers. The beauty of nature may have been replaced by man-made beauty, but isn't it still beautiful? All of this high minded theorizing on my part does a disservice in that it skips over the best aspect of Playtime: it's full of great laughs. Jacques Tati has made a comedy, after all, one that is about playing around, and despite its elaborate design, he never forgets there should be a punchline at the end of each and every one of Hulot's travails. The length of time and cost of making Playtime is legendary, but every second and every cent ends up in the picture. Its hypnotizing progression only remains hypnotizing because it's so damned entertaining. Tati may have had some things he wanted to tell us about the way the world works, but he remembered Mary Poppins' maxim that a spoonful of sugar makes the medicine go down. Playtime inspires enough laughter and awe that the grander meaning almost feels like an accidental byproduct. The smiles it puts on our faces is why Playtime is the kind of time we want to indulge in again and again. Originally written August 28, 2006. For technical specs and special features, read the full article at DVD Talk. There is also a permanent link to the review at the end of the Wikipedia entry for the film.